May 18, 2016 Emily V.
Who's into all things fringe? For me, I can take it small doses, it has to be done right, and come in the form of an accessory. When it comes to fringe on my clothes, I can leave it. Not really a big fan. But on shoes & bags, yes please. I love that the fringe on this bag is more subtle in the sense that it's cut short & there is little movement. So it doesn't really get in the way of the bag & is perfect accent detail. I find it's easy to incorporate trends or styles into your wardrobe in small doses so you can ease into it. Sort of like taking it for test drive. You're not fully committed in the sense that you bought a suede jacket with the fringe sleeves (#hello80s). 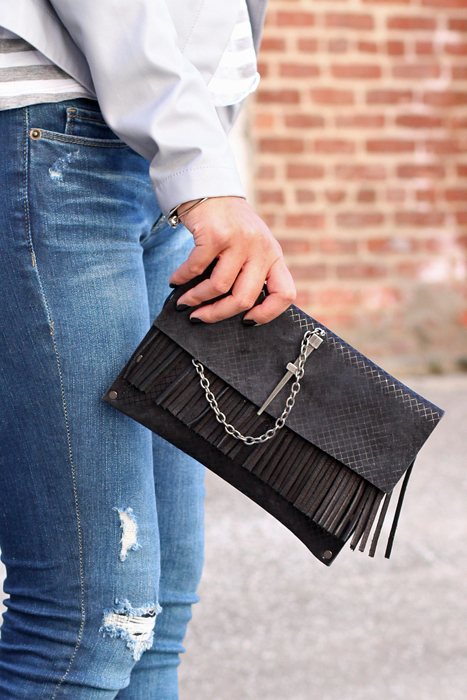 Also, this fringe clutch comes from one of my favorite designers, Leather Couture. I met her a few years back when I was in Vegas and fell in love with her bags. They are all handmade, beautifully crafted, and they all come with a touch of badass. Hope you're having a great week! Thanks so much for stopping by.